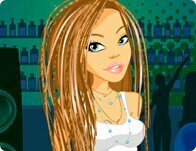 Description: As an experienced stylist, you have to coordinate hair style, makeup and an outfit that will highlight the features of your friend. Don't forget to embellish with accessories. Instructions: Use your mouse to click on and through the floating hair, clothing, and accessory options for this beautiful diva.